2017年5月11日 (木) 01:39 1,200 × 600 (22キロバイト) Zscout370 Update on colors (uses Munsell). Page 8 of SLS 693 and used http://pteromys.melonisland.net/munsell/ to choose the values. 2012年2月18日 (土) 21:17 1,200 × 600 (62キロバイト) Zscout370 There was an issue with the display? 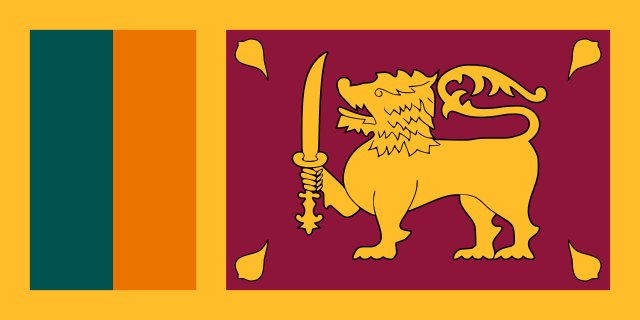 2011年11月5日 (土) 17:29 1,200 × 600 (53キロバイト) Zscout370 SLS 693 - National flag of Sri Lanka specifications (kept the lion pattern, but it was not in the right sizes and position. 2010年1月4日 (月) 22:21 1,200 × 600 (23キロバイト) Zscout370 The lion and sword came from File:Coat of arms of Sri Lanka.svg; I drew the leaves based on the document I was emailed. Not sure what to do about colors since they are in CIE and Munsell (I know the Japanese use Munsell, so we should ask them). 2010年1月4日 (月) 20:36 1,200 × 600 (19キロバイト) Zscout370 I received "SLS 693 - National flag of Sri Lanka" from the Sri Lanka Standards Institution. This is an overhaul of the image; working on minor details later. Colors will also come later, since they are in CIE and Munsell.